By Karrar Haider in Desktop. Updated on October 30, 2017 . After updating to Windows 10 Creators Update, I noticed my RAM usage surging to up to 80% after hardly 30 minutes of use. I checked some online forums and realized that a lot of people are facing memory leak issues in Windows 10. After trying multiple solutions I finally managed to bring down my RAM usage to a sane level. So in the write-up below I will discuss all possible causes of memory leak and how to solve them. Fundamentally, memory leak is a portion of the RAM that a program marks as "in use" but isn’t actually using it. This happens when a program fails to inform Windows RAM manager that they have stopped using a RAM segment and it is free to use again. Thus, Windows won’t use that portion of RAM even though it is free to use. This problem leads to higher RAM usage even though no program is actually using the RAM. Such problem can happen to any program, including Windows services, native apps, background processes, hardware drivers, and third-party apps. Tip: A quick fix to any memory leak issue is to restart the PC. As RAM is volatile memory, it will reset as soon as you restart your PC. Thus, any bad segments will also become available again. However, this will not help in the long run as the bad program will probably leak memory again. Windows Task Manager shows all the currently running processes along with their resource usage. For most programs, the Task Manager should be able to find the culprit process. Press Ctrl + Shift + Esc to open the Task Manager and move to the Processes tab. Here you will see all the active processes with their CPU and Memory usage details. Click on the top of the Memory tab (where usage percentage is written) to arrange the processes in descending order with highest memory usage process on the top. You need to look for a process that is using more RAM than usual. You’ll have to figure out yourself which process is using unusual RAM. Most probably the culprit will be using over 50% of the total RAM. However, do keep in mind that heavy programs like Photoshop or even your browser (with many websites open) can use multiple GBs of RAM. If it’s a third-party app, reinstall or reset it (if possible). Otherwise, you’ll have to get rid of it and may have to find an alternative. If it’s not a third-party app, then right-click on it and select "Search online". The internet should be able to tell what it does. 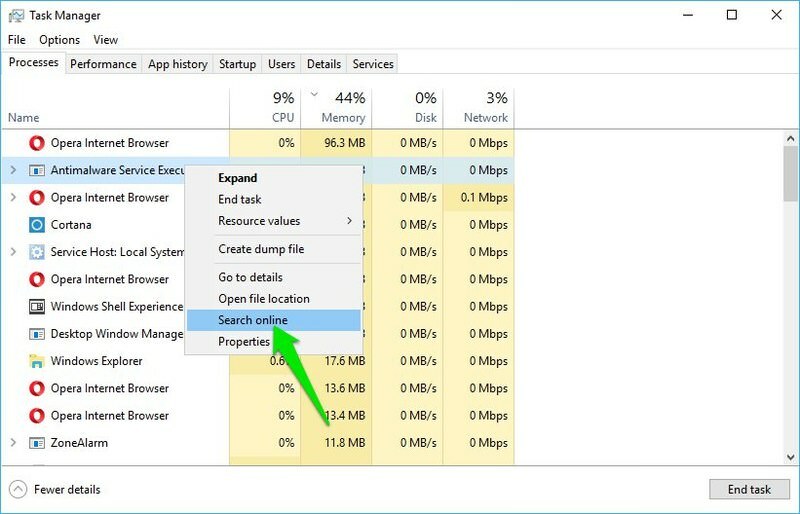 If it’s a Windows process, then search further to see if you could find a solution to prevent memory leak in it, or check the next step. 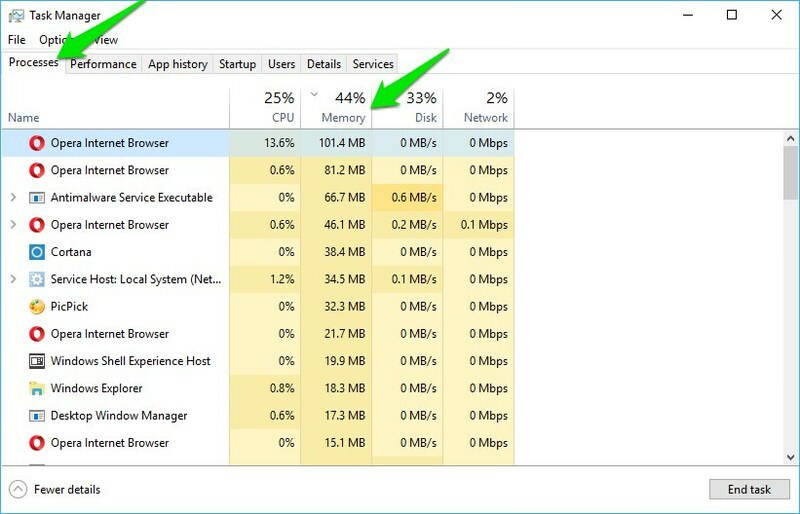 Most other solutions I have mentioned in this article can fix problems with native Windows apps and services that may be causing the memory leak. If nothing works, then keep applying the below solutions. After upgrading to Windows 10 Creators Update, there is a chance that the required drivers may not work properly for your PC. So you need to update outdated drivers to fix them. You can either do it manually or automatically, I’ll tell you both methods. Press Windows + R and type devmgmt.ms in the Run dialog to open the Device Manager. Here expand all of the contents and look for a driver with a yellow triangle icon next to it. The icon indicates that the driver is outdated or faulty. If you find one, right-click on it and select Update driver software. 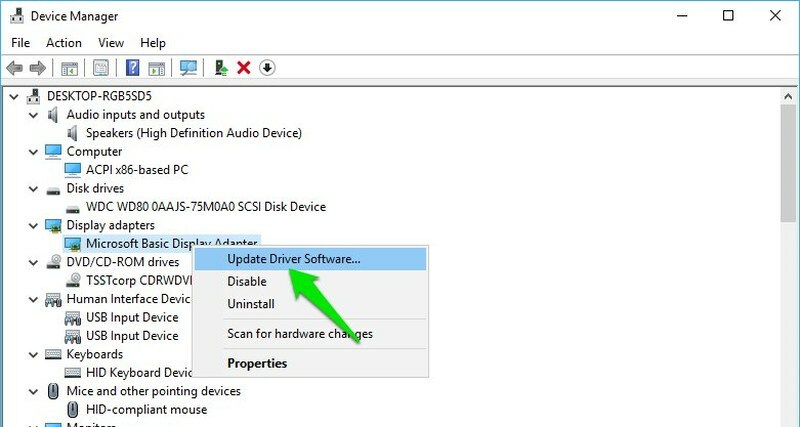 A wizard will open up, here click on Search automatically for updated driver software to update the driver. I personally recommend using a third-party driver update tool as they can find faulty drivers that even Windows may skip. 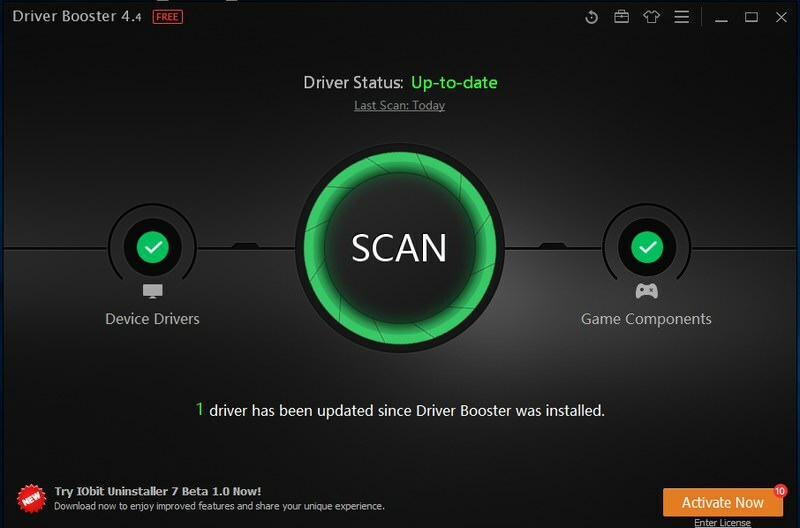 My own choice is IObit Driver Booster as it has support for over 400,000 types of drivers with a special focus on Windows 10 drivers. Just install the app and launch it. 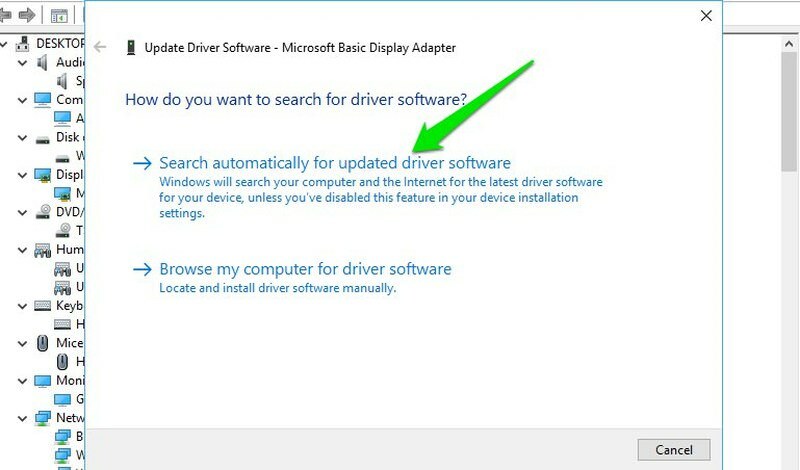 It will automatically search and list all the faulty and outdated drivers. You can then press the "Update all" button to update them. Clean Boot is a process of disabling all third-party startup apps and background service to solve problems. As most of the background processes are stopped, there is a good chance that the faulty process will be closed as well. Microsoft has a great article on how to clean boot Windows 10 and even other versions of Windows. If clean boot resolves the problem, then you can try enabling required services again one-by-one to see which one is creating a problem and disable it. A virus or malware can also surge RAM usage. The malware specifically created to damage your system usually puts pressure on RAM to halt your usage. The solution is really simple, run malware scan using a good antivirus program. 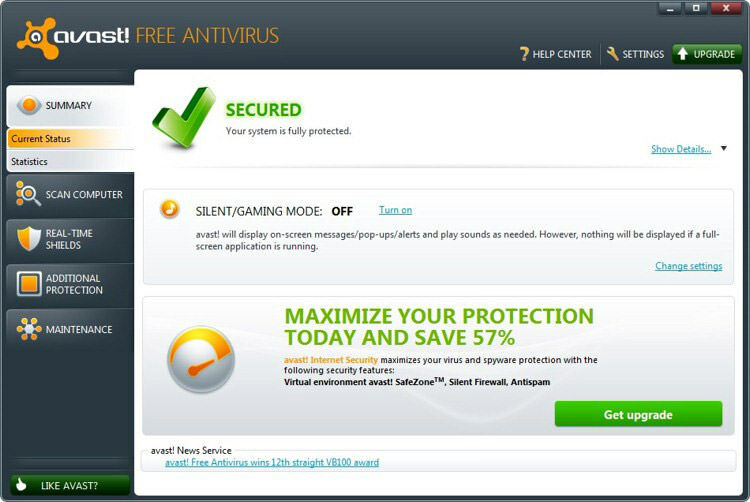 I recommend using Avast free antivirus as it is light and very powerful. Install Avast and do a full system scan. It should be able to find and delete all types of malware. In case it fails, you can also create an Avast Rescue Disk and run a scan while Windows is not operating. As Windows is not running, the virus will not be able to hide or prevent the antivirus from scanning. Similar to malware, adware may also use loads of RAM in the background. Adware shows ads as you use programs, and to download and set up these ads, it will use network and system resources, including RAM. Usual malware cleaning tools like Avast aren’t the best choice, you need a dedicated adware cleaning program. Adwcleaner is one of the best adware cleaners that will clean your PC of all adware and even unwanted program that may be using some RAM. Just scan your PC with Adwcleaner and it will find and delete all types unrequired programs. Memory leak in Windows 10 is usually caused by a faulty driver, especially the network driver. You should make sure all the drivers are up-to-date and ensure no third-party apps are eating up RAM. If you managed to fix memory leak in Windows 10, do share in the comments how you did it.